What makes Elite Orthopedic so unique? Stellar colleagues that share a common purpose. We thrive on creativity and a positive team spirit. 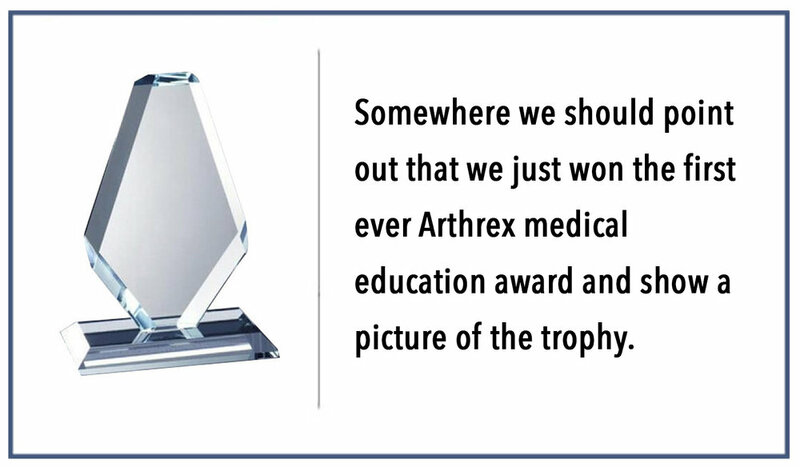 Elite Orthopedics is proud to represent Arthrex. Since 2002 we have served more than 300 surgeons and customers throughout Cleveland and all of northeast Ohio. Over the past 14 years we have grown to a team of over 30 highly skilled professionals dedicated to one mission. Having worked at Elite Ortho for a decade, I appreciate the structure and process we’ve developed over time to create the best trained orthopedic surgical team. The support and resources they’ve provided me is overwhelmingly positive. Brief description: What makes Elite Orthopedic so unique? Stellar colleagues that share a common purpose. We thrive on creativity and a positive team spirit. Arthrex is a privately held global medical device company headquartered in Naples, Florida. Our corporate mission of helping surgeons treat their patients better has helped pioneer the field of Arthroscopy. We have developed more than 8,500 innovative products and surgical procedures to advance minimally invasive orthopedics worldwide. Elite Orthopedics is the exclusive Arthrex sales agency for eastern Missouri and southern Illinois. "Arthrex Technology Consultants use evidence-based information to EDUCATE customers on the safe and effective use of our products and procedures and, CHALLENGE their way of delivering value through improved treatment and patient outcomes. They INSPIRE the adaption of new technology to help surgeons treat their patients better."